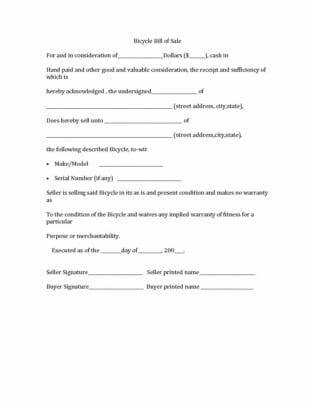 This bicycle bill of sale is a legal document considered legal by federal law of USA and is used while selling a bicycle. 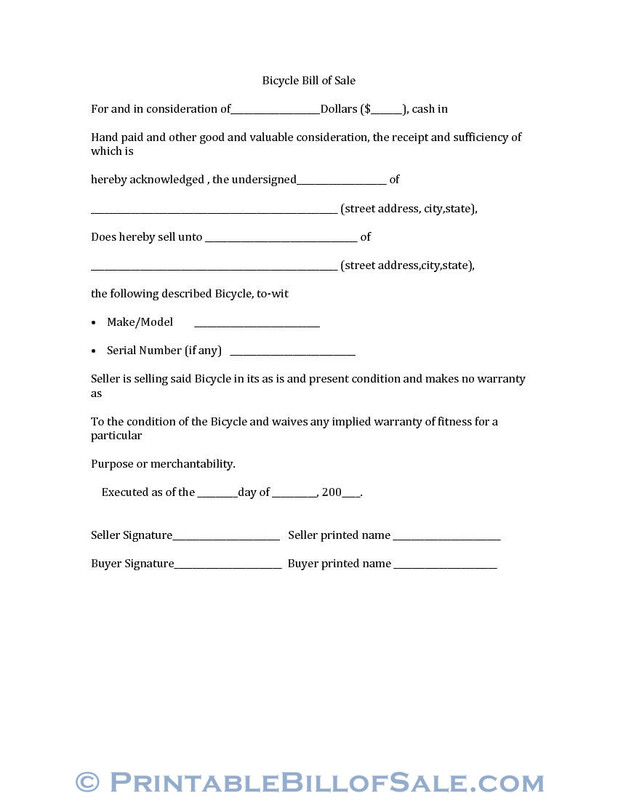 This is the form which records information about the buyer, seller, bicycle and the sale. This is general sale form which can be used in all States of USA. If a State or a country develops its own form, then that form should be used. Every State has its own laws to govern such transactions and those rules and regulations may be understood and followed. In this bicycle bill of sale, information about the seller, the buyer and the bicycle are filled in the relevant sections, in the space left blank for filling this information. Here the amount in US dollar for which the bicycle has been sold is to be mentioned. The seller confirms and acknowledges the receipt of this amount and also confirms that the received amount is sufficient to sell the bicycle to the buyer. The seller gives his/her name, his/her full residential address mentioning street, city and State. Sell unto means the name of the seller and his full address with street, city and State. This information is given here. Make means the name of the company who has manufactured the bicycle and the model means the year of manufacturing; this information is to be mentioned in this column. In this section, the serial number of the bicycle, if there is any, is mentioned. This section says that the seller is selling this bicycle on “as is basis” and on the present condition and there is no warranty on the condition of the bicycle. The seller also waives any implied warranty or fitness for a particular purpose or merchantability. The purpose of this clause is that the buyer should know that he will be responsible for any repair and maintenance of the bicycle in future. In this section, day (means date), then the month and then the year is to be mentioned. This is the date on which this agreement is finalized. In this section seller signs and writes his printed name (the printed name means the name in the government documents, like citizenship card and passport). Buyer signs and gives his printed name (this is the name in the government documents, like citizenship card and passport).